Nasi Kebuli is a great rice recipe for the whole family. It tastes good with chicken and pineapples. It's certainly a tasteful Indonesian recipe. You can make great recipes with rice and this is one of them. 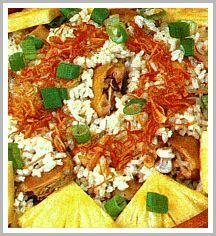 It is a savory rice and pretty easy to make. It's very suitable for dinner after a hard working day. You can make it the rice mix the day before to faster the serving time. Make the rice ready until half cooked (before you steam it) and let it overnight in the refrigerator. At the next day you just need to put the rice in steam pan and let it steam for 45 minutes while you can do other things that you need to do after a working day or playing with your children while the dinner ready in just short of time and almost by herself. And the taste would even better than the day before because the entire flavor has been completely absorbed. The advantage of the most Indonesian Recipes is that they are mostly tasted much well the next day than the first day you cook. I do that all the time, half cooking the day before when the children already to bed because I work too, and most of the time I have a little time to cook, so this method would faster the finishing time. Steam the rice until it is half cooked. Heat the oil in a wok and fry the spice paste mixture together with the cardamom seeds, cinnamon, cloves and lemon grass until fragrant. Add the pieces of chicken and stir fry until everything is coated with the spices and has changed color.